Home > Best Practice Journal > 2010 > BPJ: 33 > Antimicrobial resistance: where are we now? This article reviews the data currently available, which enables interventions to be targeted towards issues which are local and current. Two previous articles in this series have outlined the main issues related to antimicrobial resistance within the community in New Zealand (BPJ 30, BPJ 31). This article will review the data we have available now. This enables interventions to be targeted towards issues which are local and current. Surveillance of antimicrobial resistance is currently co-ordinated through the Institute of Environmental Science and Research (ESR) and reports are made available on its website. The following organisms will be discussed in more detail: methicillin resistant Staphylococcus aureus (MRSA), extended spectrum β-lactamase producing Enterbacteriaceae (ESBL-E), Streptococcus pneumoniae (S.pneumoniae), Neisseria gonorrhoeae (N. gonorrhoeae) and Haemophilus influenzae (H.influenzae). Initially this organism was detected mainly in hospitals as a result of healthcare associated infection (HA-MRSA). Strains of MRSA more closely associated with community acquisition (CA-MRSA) have now been recognised. An epidemic MRSA (EMRSA) first emerged in New Zealand hospitals in 2000. This strain was imported from the United Kingdom most likely by both patients and staff. 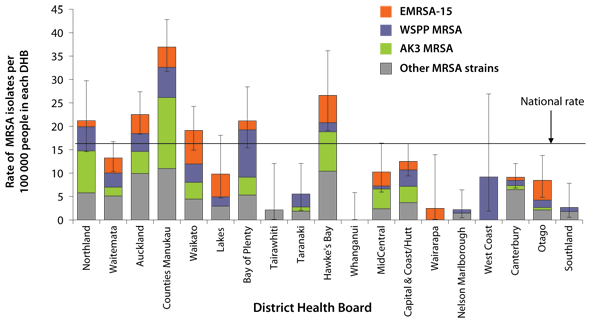 The situation as it was at the end of 2009 is shown in Figure 1 and the distribution of strains among DHBs is shown in Figure 2. EMRSA-15 is a healthcare associated infection, but the other named types (WSPP and AK3 MRSA) are community acquired. This data suggests that the amount of EMRSA-15 is decreasing, however, the number of community strains is increasing. This pattern of change is similar to that experienced in other countries. *The category “Strain not known” for 2008 represents the number of people identified with MRSA by Middlemore Hospital laboratory which did not refer the isolates to ESR for strain identification. 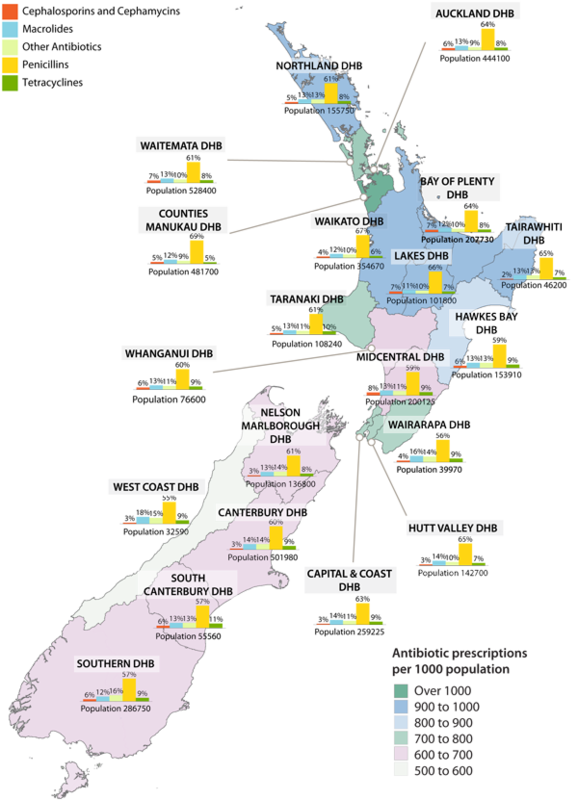 N.B Data for the Capital & Coast and Hutt District Health Boards (DHBs) is combined as “Capital & Coast/Hutt”, and data for the Canterbury and South Canterbury DHBs is combined as “Canterbury”. ESBL-E produce a β-lactamase that renders them resistant to all penicillins and cephalosporins. Many of these organisms are resistant to other groups of antimicrobials as well and are classified as multi-drug resistant organisms, i.e. resistant to three or more classes of antimicrobial. 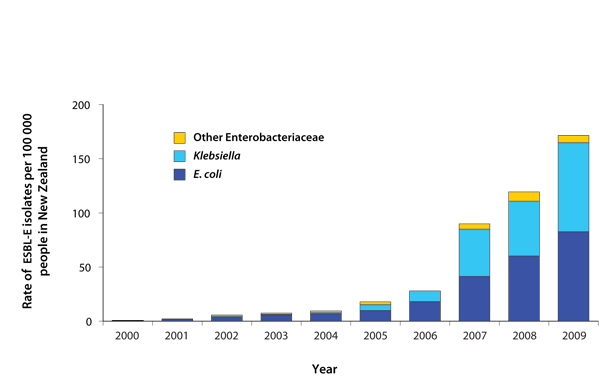 Figure 3 shows the annual/annualised incidence of ESBL-E from 2000 to 2009, demonstrating a rapid increase in isolates since the beginning of the decade. Figure 4 shows the annualised incidence of ESBL-E-producing infections by DHB in 2009. 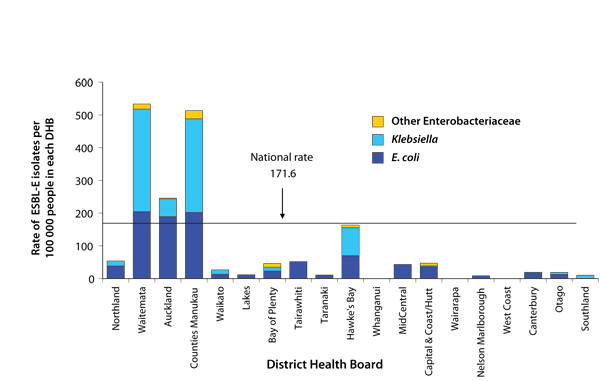 This distribution shows that more infections are encountered in the North Island compared with the South Island. Community onset was assigned for 36% of these infections. N.B. In the ESR data, healthcare-associated infection includes samples referred from emergency departments, outpatient clinics or residential care facilities. In 2008 a survey of community isolates of S.pneumoniae was performed to provide baseline serotype and susceptibility data on community isolates, prior to the addition of the 7-valent conjugate vaccine (PCV-7), Prevenar, to the vaccination schedule. Isolates were collected by two community laboratories - Diagnostic Medlab in Auckland and MedLab South in Christchurch. Overall 17% of isolates were resistant to penicillin and 13.8% were resistant to penicillin and erythromycin. A total of 12.7% were multidrug resistant. The only difference in the prevalence of susceptibility between Auckland and Christchurch was the susceptibility to chloramphenicol which was 4% in Christchurch isolates and 0.7% in Auckland. With the introduction of the PCV-7 vaccination programme, it would be expected that S.pneumoniae will be more susceptible because most of the resistant serotypes are present in the vaccine. Regular surveillance reports on the susceptibility of N.gonorrhoeae started in 2005. Since that time, ciprofloxacin resistance has increased from 15% to 25% (2008 data). However, there is considerable local variation in susceptibility in smaller centres. For example, in an outbreak of infection in South Canterbury over the December to January period 2009/2010, none of the isolates were susceptible to ciprofloxacin. The rate of penicillin resistance has remained relatively low although intermediate susceptibility to penicillin rose from 55% in 2005 to 81% in the April to June quarter in 2008. Currently no ceftriaxone resistant isolates have been found. The susceptibility of invasive strains of H.influenzae has been monitored since 2000. On an annual basis, relatively small numbers of organisms have been tested. The proportion of organisms which were ampicillin resistant by virtue of β lactamase production has varied from about 11% to 34%. Latest data from 2009 showed resistance at 17.2%. Another type of ampicillin resistance is β-lactamase negative ampicillin resistance (BLNAR). This was uncommon before 2005, but now accounts for approximately half of the ampicillin resistant isolates. In 2008, of the reported non-invasive isolates, 24.7% were ampicillin resistant and 3.7% amoxicillin clavulanate resistant. These latter isolates represent the BLNAR H.influenzae, therefore this type of resistance seems to be less common in less invasive organisms. There is some variability in the number and type of antibiotics dispensed around New Zealand. Figure 5 shows the number of antibiotic prescriptions dispensed per 1000 population, by DHB area (indicated by different colour shading on the map). 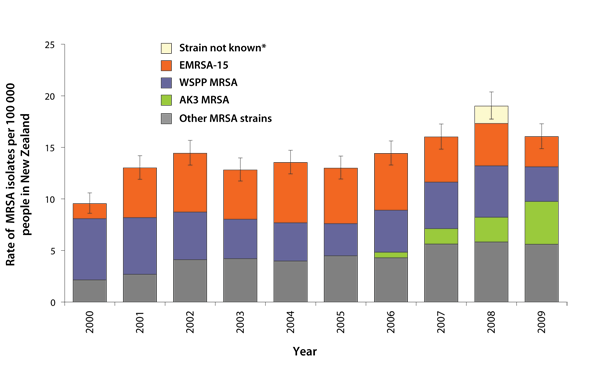 Bar charts show the percentage of these antibiotics by antimicrobial group. Figure 5 shows less antimicrobial scripts per 1000 population in the South Island compared to the North Island. This mirrors surveillance data from Europe, which shows that in general there is less antimicrobial resistance in areas where less antimicrobials are used. Figure 5: Antibiotic prescriptions dispensed per 1000 population, 2009. The surveillance information from ESR, along with patterns of antimicrobial use, highlights the current problem of antimicrobial resistance in New Zealand. This situation has changed, and will continue to change, over time. Infectious organisms are imported to this country and then spread, often in the healthcare setting first, before becoming established in the community. Reducing the use of antimicrobials has been shown to reduce the occurrence of these organisms overseas and this may well be the case in New Zealand too. Richardson A, Pope C, Couper J, et al. Annual survey of methicillin-resistant Staphylococcus aureus (MRSA). ESR; 2009. Heffernan H, Woodhouse R. Annual survey of extended-spectrum beta-lactamase (ESBL)-producing Enterobacteriaceae. ESR; 2009.